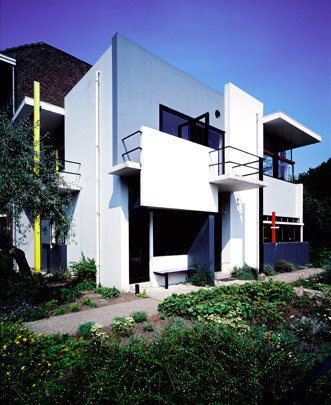 The Rietveld-Schröder house constitutes both inside and outside a radical break with all architecture before it. Inside there is no static accumulation of different rooms but a dynamic, changeable open zone. This latter innovation is largely due to the client, Truus Schröder, whom Rietveld had met when altering her previous house. Her involvement of Rietveld in the design of a new house resulted in the kind of catalytic collaboration between client and architect often encountered at the birth of a masterpiece. The house was built against the head of a row of houses on the edge of town, with in those days an unhampered view of the surrounding country. Having established the broad lines of the plan with Madame Schröder Rietveld began designing the exterior aided by small models and sketches. The facades developed from a painted rectangular box into a collage of planes and lines whose components are purposely detached from, and seem to glide past, one another. Like Rietveld's celebrated red and blue chair each component has its own form, position and colour. The colours were so chosen as to strengthen the plasticity of the facades: surfaces in white and various shades of grey, with black window and door frames, and a number of linear elements in primary colours. The ground floor can still be termed traditional; ranged around a central staircase are the kitchen and three sitting/sleeping spaces. The living room upstairs, given as an attic to satisfy the planning authorities, in fact forms one large open zone except for a separate toilet and bathroom. Rietveld wanted to leave the upper level as it was. Madame Schröder, however, felt that as living space it should be usable in either form, open or subdivided. This was achieved with a system of sliding and partly-revolving panels. When entirely partitioned in, the living level comprises three bedrooms, bathroom and living room. In-between this and its open state is an endless series of permutations, each providing its own spatial experience. Madame Schröder, who lived here until her death in 1985, made daily use of this system.